It pops up in the context of author Douglas Coupland's everyday telephonic activities; at 12:45pm, according to the little Flash animation, Coupland "settles a lunchtime architectural argument" by going to BLDGBLOG. So I'm retiring on the royalties to Brazil, where I'll re-reverse the flow of the Amazon River and report back in a few years' time. My name is David Hartt, and I was the Creative Director for the BlackBerry Pearl campaign. 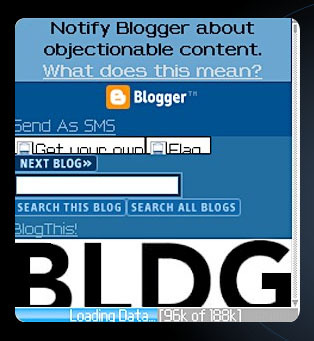 I'm also a daily reader of BLDGBLOG. I to thought it was cool that Doug enjoyed your site. The reason your site looks kind of wonky and the logo is obscured is because this is a screenshot of how it actually renders on the Pearl's web browser. I appreciate your obsessions; please keep the awesome content coming. You're so totally famous now! I can say I (virtually) knew you when. Congrats on the awesome free advertisement. If only we could all be so lucky. Although, I have to say, the way those adds pop-out when you roll over them--ANNOYING! (Maybe Mr. Hartt could work on that?) Still, I lust after the Pearl. Maybe they'll give you one as payment? Hey David - Thanks for the inclusion, and for clearing up the half-logo thing. 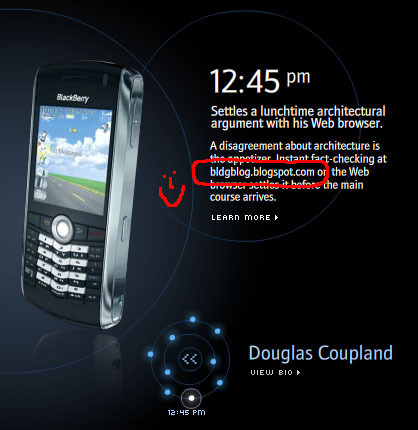 I'll have to adapt BLDGBLOG for hand-held media someday... And good to hear that you also like the site! I'll try to keep it up. And djc, they bought me a parcel of land at the headwaters of the Amazon where I'm busy excavating an inter-connected network of trenches and future oxbow lakes with fourteen of these. That's so excellent, Geoff. "Generation X" was an important book for me, and it actually raises my opinion of D.C. that he reads your blog! we are pleased to announce the launch of the perfectcity.net blog. On October 23rd, the blog was presented to an international audience of architects, urban designers, real estate investors and property financers. The perfectcity.net blog is an interactive and international platform for architects, urban designers and real estate investors. The idea and the purpose of the perfectcity.net blog, which was initiated by Eurohypo AG, Europe’s leading bank for property and public sector finance, is the vital discussion about the future of our cities. The interactive, personal and dialogue-based exchange of ideas, visions, and challenges concerned with the future of our cities is the central objective of the blog. Blog posts by Daniel Libeskind or Klaus Toepfer, for example, are qualitative contributions stimulating the international dialogue of architects, urban designers and real estate investors. We, that is trommsdorff + drüner, innovation + marketing consultants GmbH, are engaged with the conception, design and the carrying out of the perfectcity.net blog. We believe that your Internet domain in the area of architecture and urban design is relevant and of interest to the visitors of perfectcity.net. For that reason, we decided to offer the readers of perfectcity.net a link to your Internet domain. In return, we believe that the perfectcity.net blog is relevant and of interest for the audience of your domain as well. Hence, we would be very pleased if you offered your visitors the opportunity to learn more about perfectcity.net. In particular, we are looking forward to your visit on perfectcity.net and your personal participation in the discussion about the future of our cities. Thanks for the note, Sebastian. I'll check it out. Looks like the birth of a nice blog... I like the "ugliest-city-of-the-world" poll.